Subject: Led Zeppelin II – an illustration and limited-edition print created by artist David Juniper for the cover of Led Zeppelin’s 1969 Atlantic Records release titled “Led Zeppelin II”. Led Zeppelin II was released in October, 1969, and became the first LZ album to go to #1 on the U.S. album charts, unseating “Abbey Road” by The Beatles for the top spot. It was the first recording with engineer Eddie Kramer (famous then for his work with Hendrix) and his expertise, combined with their desire to “keep it raw” in the studio, produced a record that influenced every heavy metal/hard rock record (and act) that followed. Amazingly, this record took 8 months to record, since the band was touring the U.S. and the U.K. most of the year, and so they’d go to the studio during breaks to lay down tracks whenever possible. Although they could not spend that much time writing new songs, their re-workings of the rock and blues standards (“Bring It On Home”, the hit “Whole Lotta Love”, and others) let them add the Zeppelin touches – guitar solos, extended drum solos, pounding bass lines – that turned these tracks into what would become “classic Led Zeppelin”. Robert Plant was able to exhibit his song-writing prowess, however, on new tunes such as “Ramble On” and “What Is and What Should Never Be”, and it is pretty obvious that Kramer and Jimmy Page twirled many a knob on the mixing board creating the psychedelic center section of “Whole Lotta Love” (creating a 6-minute hit song during a period where 3-minute hits were the norm). In 2003, Rolling Stone magazine ranked the album #75 on their list of “Greatest Albums of All Time”. The band opened many of their live shows in 1971 and 1972 with "Immigrant Song" followed immediately by "Heartbreaker", while during subsequent tours it was often played as an encore. "Heartbreaker" and "Communication Breakdown" were the only songs to be played live during every year that the band toured. However, on commercial radio, "Heartbreaker" typically segues into the next song on the album, "Living Loving Maid (She's Just a Woman)," However, they would never be played this way during live concerts because (apparently) Jimmy Page did not like playing "Living Loving Maid". “In the late sixties in London, anything seemed possible!! I was employed at the time in a boring Art Director’s job, so I got a lot of satisfaction out of moonlighting on speculative stuff. 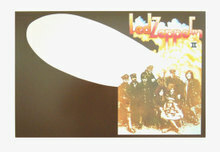 The music of "Led Zeppelin I" had blown me away and so, on spec, I mocked up a fold-out design for the second album and took it to (Zeppelin’s manager) Peter Grant and Micky Most at Rak Records. I had a few friends starting to get into the music industry and they helped to point me in their direction. The combination of collage/photography and airbrush illustration was groundbreaking for me, because the traditional airbrush technique was very tricky, especially when compared to today’s digital equivalents. The cover imagery was completely experimental and I liked the combination of the abstract ghostly Zeppelin shape along with a faded sepia WW1 photo of German Aviators. All the faces were replaced or altered (sunglasses & beards on some of the pilots!). In amongst the four band members (airbrushed in from a publicity photograph) are Miles Davis (or was it Blind Willie Johnson? ), a girlfriend/muse of Andy Warhol (perhaps Mary Woronov) and the astronaut Neil Armstrong. The original photo of the Jasta Division of the WW1 German Air Force came from an old book about the ‘Sopwith Camel’, which was a famous British bi-plane from WW1. I used bright inks to make the illustration parts really pop. I just presented it to the group and they went for it, with only a few changes to the inside spread (see below). The outside cover went through as it was proposed. The inside image is full-on psychedelia, in contrast to the original idea discussed, which had a Zeppelin flying past the Statue of Liberty. They did not want something on the inside with a similar feel to the outside, so I just went for a colourful painting as a complete contrast to the outside. I remembered a documentary film of 1920/30's German architecture and thought this approach would give the image a heavy rock/blues feel. Anyway, from that point forward, the group’s management was all very friendly and used me on other covers for some of their other artists, including Donovan and Lulu. Another great treat was to be asked down to Olympic Studios in Barnes while they worked on the recording, but what pleased me the most was that cover was nominated at the 68' Grammy Awards! I grew up in Epson Surrey UK, as did Jimmy Page, and we went to art schools in the same area. This area was a great place for music fans, and I would have liked to have taken the time to learn the guitar, but decided instead to concentrate on drawing and painting. I still wish I had done both. I have been a professional Artist and Designer for 40 years including stints in Ad Agencies, a Studio (Wurlitzer) partnership and freelance illustrating/designing. My Web Site contains loads of images www.davidjuniper.com if you’d like to see what I’m up to these days. Artwork and photographs Copyright 1969-present by David Juniper - All Rights Reserved. All other images and text Copyright 2007-present by Mike Goldstein - All Rights Reserved.